Ronde de Bordeaux: an early ripening, productive, robust fig with long finger-like leaves and berry flavored fruit. With red pulp and great molasses strawberry flavor, Ronde de Bordeaux is a top fig for cold areas, and lauded by prestigious French grower, Pierre Baud. 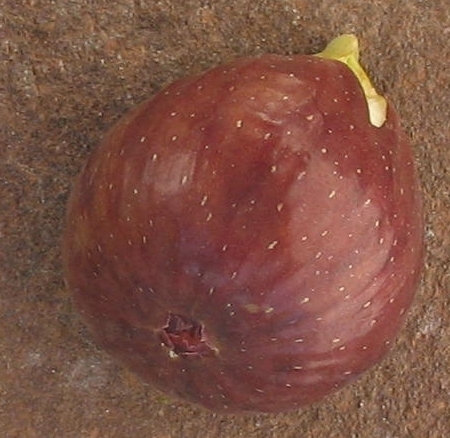 Ficus Carica, the common fig, originated in Mediterranea; however, over time many fig cultivars have become identified with certain locales and are so named, whether near Mediterranea or not. Ronde de Bordeaux is named after the unique French Atlantic port city where it gained renown. This beautifully formed maroon fig with very smooth skin is firm and strong in shape, thus tolerates handling, while retaining the characteristic delicate pulp of figs. Ronde can ripen nearly as early as any fig. Showy and strong, prolific and flavorful, Ronde de Bordeaux has been called the perfect fig.